From Champaign County Historical Museum. Photograph taken by Dori (dori@merr.info). Before 1900, some Western cities had telephone service, but most folks who lived on farms or ranches had to go into town to use the phone. Telephone poles and lines connected towns, but it wasn’t until later that they extended to individual rural homes. Stores and saloons in towns installed telephones for the townspeople to use. 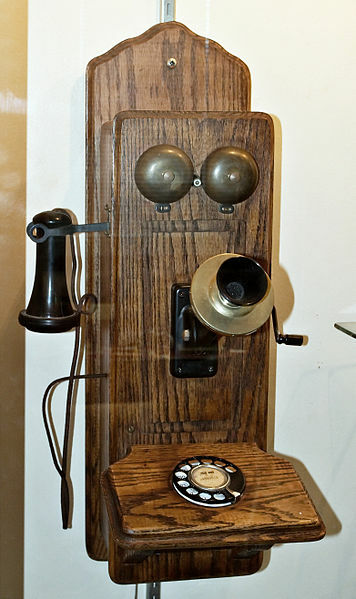 This very common early phone was mounted on the wall, so a caller had to stand to use it. There were bells, a stationary mouthpiece, and a receiver you held to your ear. To begin, you turned a crank on the side to generate electricity. I believe the caller turned the crank when the conversation was over, too. The telephone pictured has a dial for phone numbers, but other ones did not have this. You spoke to a person, an operator, and he or she connected you. In When I Grew Up Long Ago, Alvin Schwartz writes that callers tended to raise their voices when they spoke, not because they had to, but for psychological reasons, because the people were blocks apart. In the late 1800s and later, a “call” was the term for a visit. “Callers” were visitors, and “gentleman callers” were often suitors. The phrase “telephone call” meant a visit conducted by telephone, and it has stayed in our language over a hundred years.